March has finally arrived, and in some books (okay, mine), that means spring is nearly here. It has been a long, long winter for me, and I’m craving greenness, brightness and the smell of living things. 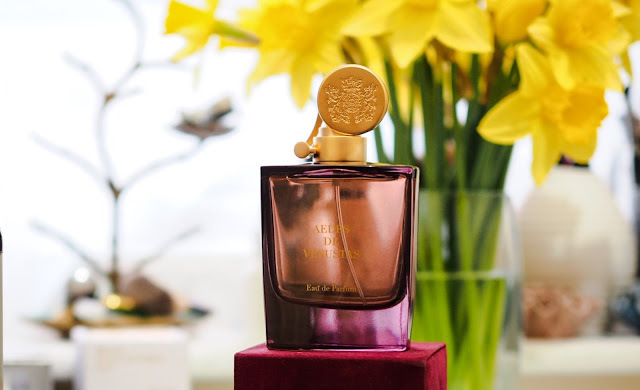 A bottle of Aedes de Venustas signature fragrances turned up on my desk quite unexpectedly last week, and it has fulfilled all my spring-y requirements beautifully. I was reading recently, and some “science” reports popped up that stated that a marked preference for bitter tastes might mean you’re a psychopath, and went on to extrapolate that a marked liking for black coffee, gin and tonic, or even dark chocolate (!) might be a pointer to your mental state. In that case, I found myself wondering if a marked preference for sour might be the sign of being a total misanthrope? For my name is Get Lippie, and I love sour things and hate people. The reason why I mention this will become clearer later. Aedes de Venustas begins with vibrant rhubarb, nostril-tingling and mouth-puckering in the most delightful way. It invokes memories of me, as a child, with my parents digging around in the vegetable plot that we dug out in the back garden one summer. That was the summer in which we simultaneously discovered that rhubarb was the only thing that would grow in our rocky, clay-heavy patch, and that the entire family hated gardening. These days, I love rhubarb in any shape or form, whether raw with the fresh cut end dipped in sugar (a crunchy, textural magnificence), or cooked into a dessert item, or in a very specific chutney from Waitrose that was the only way I could eat many meats when my parosmia was its crippling worst. I love it in soaps, hand lotions, candles, shower gel anything. I mean, who hasn’t taken a 3 mile detour (on foot) during a trip to Paris to see if a particular shop has restocked a much-loved rhubarb shower-gel, hmn*? Just me? Anyway, rhubarb is a wonderfully astringent scent, akin to lemon and grapefruit, but with a slightly greener, more vegetal aspect to it. As rhubarb is technically a vegetable, this shouldn’t really be a surprise, I guess. Aedes de Venustas, in spite of pairing rhubarb with the soft green fuzziness of tomato leaf, the clean and flinty mineral tones of vetiver, alongside just a whisper of bright green apple, deftly avoids being a gourmand fragrance, in spite of its fruity star guest. By avoiding any sugar in the mixture whatsoever, and allowing the sharp green and pink stalks of rhubarb to take centre stage and dominate the scent throughout the wear, Aedes is a sour-fragrance lover’s delight, a fruity fragrance for grownups, if you will. This is no “rhubarb and custard” confection and I, for one, am grateful for that. Aedes is a fairly linear fragrance, in that what you smell at the beginning is more or less what you will smell throughout, but the dry-down does pull a little sweetness through as the rhubarb fades, and some of the other fruits (berries, mostly, I think) in the composition begin to assert themselves. It’s fairly quiet, and I find I need to apply quite heavily to get the full effect (but please, of course, bear in mind that I have a compromised olfactory system), but this isn’t a fragrance that is likely to offend in the office, as the sillage is quite low, even when application is a little heavy-handed. You write the most beautiful descriptive stories in your blog, some of which I have never heard of yet I fell like I can literally smell them, imagine wearing them. Roll on another London trip for me to head to the beautiful store’s that sell these gems.